For the six time in eight years, Larkin and I played in the Petersen Shootout [2010, 2011, 2012, 2014 and 2016]. We missed 2013 when Rod kept moving the date around and it finally landed on a weekend when Sharon, Jack and I were in Hawaii. In 2015, Larkin wasn't available. I signed up with Borja as my wingman, but when he canceled at the last minute, I bailed. Scrambling to get going, I finally left the house about 8:50 am. Taking Highway 50 to South Shore to the Kingsbury Grade, I got to golf course about 11:10 am. It was an extremely easy drive with very little traffic. 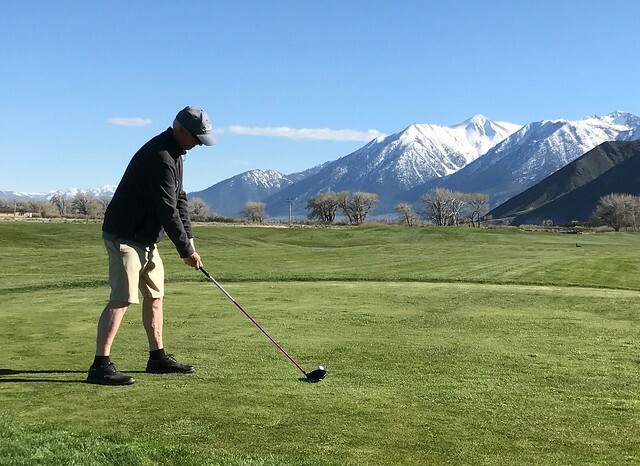 I was surprised how quickly I got to the Genoa Lakes Golf Course. We played the nearby Genoa Ranch Course in 2010. Rod started the day with a long putt contest at 11:30 am. The group teed off in a shotgun start at 1:00 pm. Larkin and I played with Dave and Wes. While the sky was clear, the day was cold with a stiff north wind. This year's group was big. While in most of the previous years, the count was in the mid-twenties. This year, there were 42 people in the tournament, including Kevin, Rick, Art and Colin. After struggling at Se@ Ranch in February, I was very pleased with how I played. I shot a liberally scored winter rules 101. I pared four holes and only three putted two greens. The course played slow. It was after 6:30 pm by the time we finished. The group is staying this year at the Carson Valley Inn in Minden. I stayed at this hotel in a suite once in late 1991 with she-who-will-not-be-named. After getting cleaned up, Larkin and I spent some time in Rod's suite before we headed to a late dinner. We had dinner at the CV Steak (Pacific Calamari Steak and spicy Seafood Linguine). We literally closed down the restaurant. We crashed in the room about 11:30 pm.